My friend Lola is the genius behind the most excellent Maps For Girls. You fill out this handy form & Lola will draw you a map, or you can draw her one, or both! A dream I had when I was seven about flying to the moon…where all the people drove firetrucks & only ate ice cream. 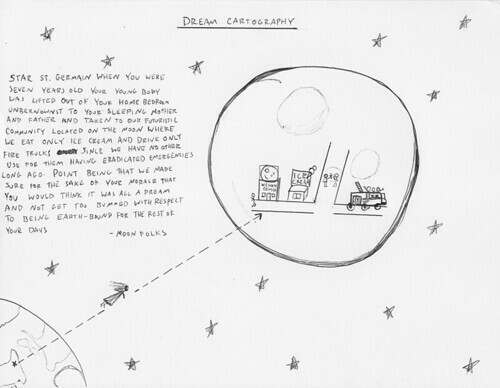 Label it: Dream Cartography. This map made my day. Perhaps she’ll draw you one & she’ll make your day too! I love love love this map. It makes my heart squeal!!! !